Probably every installer of satellite TV, owner of the satellite receiver, and a man who himself decided to install a set of his TV wondering flashing. In this article we will talk about why this is done, as well as on how it is done in practice. Flash It is often called the Software or Software - is the main program of the receiver, which is located in the non-volatile memory and controls the device, is engaged in the reception, decoding, displaying it on the screen, service functions. New firmware (software application) issue to resolve detected problems and glitches present in older versions with the new firmware, it is possible to make russifitsirovat menu, make a comfortable operation of the product in the new versions, you can see the satellite, which was not there before. Because over time, the TV channels change their positions on the satellite, its frequency, and the names, it is not rare problems and confusion, which is also solved by using the new software. It requires aspect-firmware update in order to see a different encoding BISS, Nagravision, Viaccess, Irdeto, Mediaguard 1 (Seca), Conax, etc. - With tuner to the tuner of the same model. method is quite simple and fast, but you need several conditions - the presence cable, presence at the leading tuner appropriate scientific bootloader version and the older version of the firmware. Disadvantage of the method is not always work, the problem of finding a receiver with Fidler firmware. - From the computer to the tuner. The most common and the best way to update the software, has many as New firmware can be downloaded from the Internet, download correctly using the downloader. These programs usually have many features with the ability to update the firmware, change the boot loader (bootloader), channel lists, lists, and other keys. - with flash, for some models. With USB-connector. This type of upgrade does not support all receivers, basically just a new release also requires compliance with certain conditions of a particular file type is in some directory for updates, etc. 1. Standard, the most common 2-3, 3-2, 5-5. 2. Complete wiring of 2-3, 3-2, 4-6, 5-5, 6-4, 7-8, 8-7, 9-9. 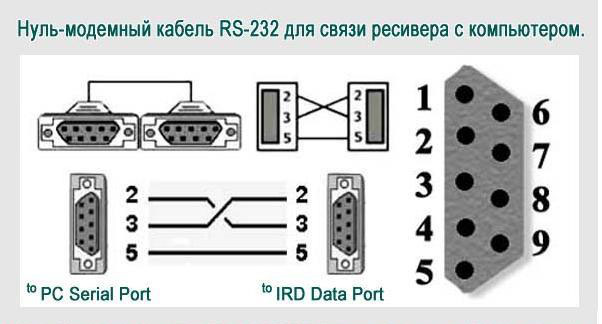 Also suitable for connecting two computers, routers, and other equipment. Is more versatile. 1. Connection Body findings should be made of all or almost all, because This improves the reliability of data transfer and increases the overall immunity. 2. It is best to use a shielded cable, not just stranded. 3. In most receivers use only 3 wires, and unused pins better not fluster, but preferably insulated from other leads. 4. 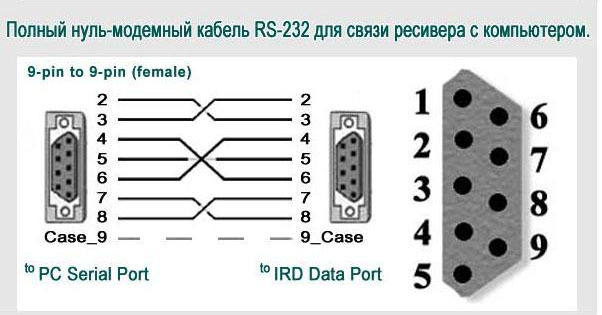 Be careful when using the factory altered and cables as they may be confused data pins 2,3.